Earlier this year I spoke at a conference on ‘The Value of Popular Music’, and on hearing the news that the recent fundraising concert performed by Langford-based community choir The Cotswold Voices had raised over a thousand pounds towards the cost of a new piano for a local primary school, I was reminded that sometimes the value of popular music might be more obscure than we first think. Upon receiving a cheque from the choir Headteacher Mr Goodwin, of St Christopher’s School Langford, commented “I was speechless when they informed me this week that the evening had raised £1230. We are truly blessed to have such fantastic support from our local community” (School Newsletter 24th Oct 2014). The fundraiser concert, complete with food, wine and a sumptuously lit venue, comprised a varied two-part programme of popular songs, both old and new, with a sprinkling of pieces from popular shows and musicals. Highlights included Viva la Vida (Coldplay), Pompeii (Bastille), Like a Prayer (Madonna), With or Without You (U2), Sound of Silence (Simon and Garfunkel), Defying Gravity (Wicked) and medleys of Abba and BeeGees favourites. The songs were all expertly arranged into original four and five-part harmonies by talented choir leader Joe Moore and sung with verve by this dynamic choir, comprising singers of all ages from Langford and the surrounding areas. Goodwin, who attended the concert, described the event as “a truly memorable evening full of energy and fantastic singing” (School Newsletter, 24th Oct 2014). The social and health benefits of singing in a community choir have been well-documented, indeed a friend only recently handed a magazine article to me which claimed that choir members can experience health benefits ranging from increased oxygenation in the blood, stress reduction, an end to snoring, increased lung capacity and wrinkle prevention (The Lady, May 2009). Whilst I can’t vouch for such medical claims, it’s clear that the benefits of community choirs extend beyond those reserved for the participant singers. The Cotswold Voices have a strong record of raising funds for local charities; in a joint concert with Welsh Male Choir Cor Y Gyrlais earlier this year they raised £1900, and their renditions of popular Christmas songs performed in Swindon Town Centre last year raised over £100 in donations from passers-by in under an hour. Their next concert takes place at Blunsdon House Hotel, on Sunday 23rd November at 7pm. Tickets cost £5 and will raise funds for the Thamesdown Hydrotherapy Pool and NSPCC – charities which both received substantial cheques after the choir’s fundraising concert at the same venue in 2013. 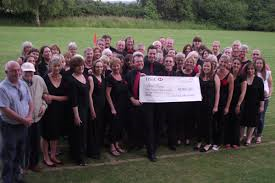 The Cotswold Voices also perform at weddings and birthday parties and participate in a wide variety of local entertainment events in the local area, demonstrating perhaps that popular music’s value can indeed extend well beyond the immediate concerns of the music industries and can be appropriated and adapted to add value of a less commercial nature to the communities it inhabits. For further information about Cotswold Voices please visit their website at www.thecotswoldvoices.com, or to find a choir closer to you visit British Choirs on the Net at www.choirs.org.uk.